Billet Radiator Cap Cover 93-up Dodge, Chrysler, Jeep Billet Radiator Cap Cover 93-up Dodge, Billet Radiator Cap Cover 93-up Chrysler, Billet Radiator Cap Cover 93-up Jeep, Dodge Challenger Radiator Cap Billet Cover, Dodge Charger Radiator Cap Billet Cover, Chrysler 300 Radiator Cap Billet Cover, Dodge Ram [Billet Technology 30011 Cover] - $31.95 : 3rd Strike Performance, Your Source for Late Model MOPAR Performance Parts and Accessories! 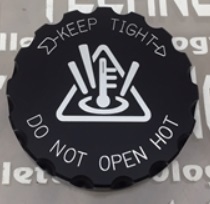 This Billet Technology Radiator Cap Cover is an awesome piece manufactured from domestic certified, solid 6061-T6 aircraft aluminum. Offered in various finishes and custom options with your choice of standard engraves shown. Installs quickly with the provided allen key and set screw. 2017-18 Dodge Challenger Demon (Demon uses two one on the coolant reservoir tank and one on the blower coolant reservoir tank). 2015-up Dodge Challenger Hellcat (Hellcat uses two one on the coolant reservoir tank and one on the blower coolant reservoir tank). 2015-up Dodge Charger Hellcat (Hellcat uses two one on the coolant reservoir tank and one on the blower coolant reservoir tank). 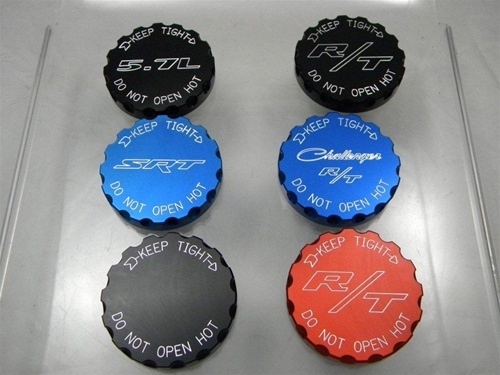 Must have stock or stock style radiator cap with the 4 nubs on the corners! Please contact us for Custom Images and/or finishes at 3rdstrike@charter.net or 573-258-9999.